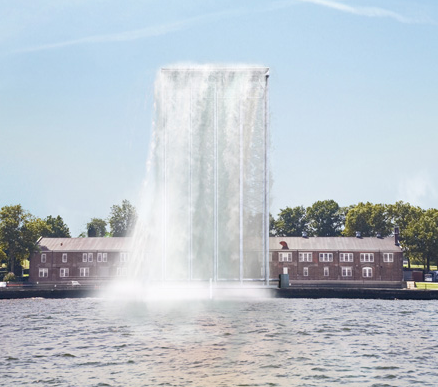 Illustrious installation artist Olafur Eliasson brings his imagination into open air. 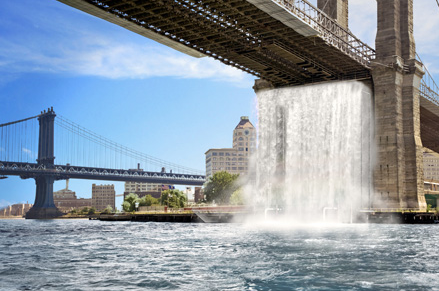 Four 90-120 foot man-made waterfalls are in the process of being constructed as a public art display in lower Manhattan. Eliasson said the exhibit gives viewers the possibility to reconsider their relationships to these spectacular surroundings. The Brooklyn Bridge will be transformed into a natural wonder with a massive span of water rushing out its middle column. Suspended waterfalls will shoot mid-air between piers four and five, Governors Island and Pier 35. The monumental falls will run from 7 a.m. to 10 p.m. daily and will be decorated with light following sunset. In developing The New York City Waterfalls, Eliasson said he tried to work with today’s complex notion of public spaces. The waterfalls have been designed to protect water quality and aquatic life while celebrating public art in America’s cultural and metropolitan heart. The project is presented by the Public Art Fund, which commissions a wide variety of emerging artist projects and installations. New York City Mayor Bloomberg said large-scale public art is a part of what makes his city the cultural center of the world. “It excites New Yorkers and encourages visitors from around the world to experience a once in a lifetime moment,” said Mayor Bloomberg. 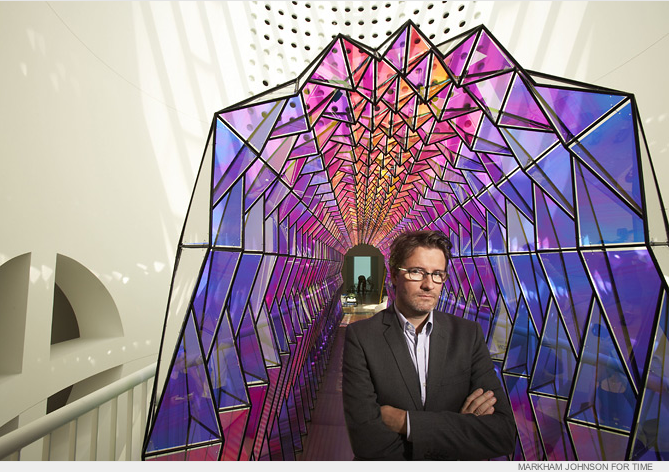 Bloomberg expressed that he is exceptionally thrilled that internationally-renowned artist Olafur Eliasson has chosen New York City as his latest canvas. “The Waterfalls exhibition is the next chapter in the City’s great cultural legacy,” said Bloomberg. The falls are free to the public, accessible by foot, bike, car or ferry. The Governors Island and Brooklyn Bridge falls will be visible from the Staten and Governors Island ferrys. Circle Line Downtown will provide a 30-minute water tour of the New York City Waterfalls. Free tickets can be obtained at www.circlelinedowntown.com. To see more images of the falls and read about the Public Art Fund, go to www.nycwaterfalls.org. Olafur Eliasson’s current exhibit, Take Your Time, at the San Francisco Museum of Modern art is fascinating and inspiring. The installation looks like an iridescent, crystalline hallway to the future. His massive art installations are nothing but skilled. With an interest in science and atmosphere he lets the viewer become an element of the art, allowing visitors to literally enter into the body of his work. 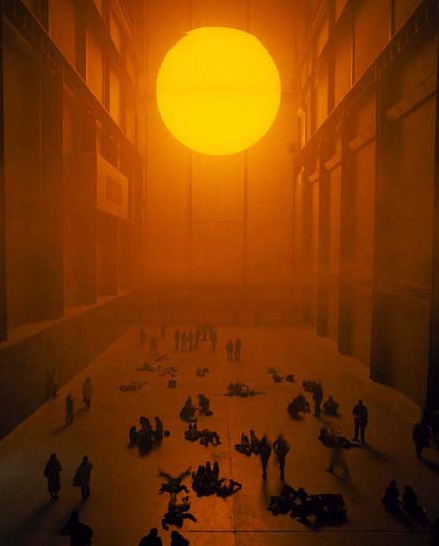 The Weather Project, which exhibited at the Tate Museum four years ago floored museumgoers. Eliasson covered the London museum ceiling with mirrors, fixing a giant sun-like tungsten orb in the center. The suspended half orb had the perception of a spherical sun. Visitors lay, coiled on the floor, transfixed as they reflected into the atmosphere above them. The project gave the museum the perpetual feeling of a suspended dusk sunset. The grandiose scale of Eliasson’s work attracts a lot of attention. The hype is not merely about the size of his work. Each exhibit is vastly unique from the others in medium and aesthetic, while retaining common themes of atmosphere, space and illusion. Take Your Time will be showing in San Francisco through February 24, 2008.